You’re scouring the web for an espresso machine and you suddenly stumble upon the Krups super automatic espresso maker. You stop and ask yourself “What’s so super about it?”. Well, it’s not like it’s going to start taking care of every choir in the house for you, but the truth is that it is good at one thing and that is making excellent espressos. In fact, with the touch of a button, this machine can grind, boil, brew and even clean itself, so that you don’t have to worry about wasting your time cleaning it manually. Where other machines require that you grind the coffee beans, when you have a super automatic machine, the only thing you need to worry about is adding coffee beans to the hopper. The Krups EA9010 is definitely one of the best super automatic espresso machines that the company has released and not only does it have an excellent build quality, but it also comes with a wide range of incredible features. Not only does it easily brew coffee, but it can also clean itself automatically. Take a look at some of its features below and you’ll realize why so many people love to use it every single day to brew delicious espressos and more. Automatic parameter settings based on the recipe you select (water temperature, fineness, grinding and also coffee quantity). Digital touchscreen allows you to customize each and every drink. You can even customize profiles and program favorites. Metal conical burr grinder with automating grinding option. A total of seventeen recipes you can prepare with the touch of a button. Probably one of the best things that a lot of people love about this machine is the fact that they can prepare a wide range of drinks with it. Some examples of the ones you can choose to prepare from the LCD touchscreen include cafe latte, cappuccino, coffee and of course, espresso. There are of course many other drinks you can brew, including different types of espresso, such as lungo, doppio and ristretto, but also Red Eye, black coffee and americano. If you’d like to whip up a milk based drink, then under this menu you’ll find options that allow you to do that easily. Some of the drinks you can whip up include coffee with milk, flat whites, café au lait, but also steamed milk and hot milk. However, maybe you have some friends over who just want to drink some tea. Well, in this case, you can program the machine so that it brews some hot water. The EA9010 has a small footprint and it doesn’t have all the bells and whistles that some people may expect of it, given the price. However, even though you don’t get a product that’s encased in a super premium material or has a jaw dropping design, the EA9010 is years ahead of its competition in the espresso making department. After all, that’s why you actually spend so much on a high end espresso machine: to be able to prepare drinks that are simply delicious with great aroma and flavor. The small LCD screen of the EA9010 does make it stand out a bit, especially because it’s a color and not a monochrome or black and white screen. It also comes with a cup warmer made of SS which furthermore adds to its quality and premiums feel. By now, everyone has a clear idea of what the EA9010 can do for them, but what about maintenance and cleaning? A lot of machines require users to take them apart and clean each and every individual piece of them manually. However, if it’s that tedious to clean an espresso machine, then a lot of people are going to be turned off by this fact and look for something better. Luckily, the EA9010 doesn’t disappoint in this regard. That’s because it features an automated descaling and cleaning program that can be programmed to run on its own with very little intervention. Talk about saving time and making the most of your espresso machine. Automatic cleaning saves you the time and effort of actually cleaning the machine on your own. Built in burr grinder is very effective at processing whole beans to order, but it can also grind pre ground coffee. Can prepare amazing quality steamed milk cafe drinks and espresso shots with the push of a single button. Thanks to the elegant milk foam feature, you can now easily create a rich and luxurious foam for a wide range of drinks. The price is a bit high compared to similar models on the market, making this a premium machine that only a specific range of buyers are going to consider. Despite the automatic cleaning process, the EA9010 will still require a good old hand-on cleaning from time to time. You will also need to empty the drip trays quite frequently. If you’re a home barista hobbyist, then you’ll not appreciate the fact that this model features no 100% manual controls. This KRUPS EA8808 two-in-one Cappuccino machine will provide you with virtually every espresso coffee drink you could wish for with a single touch—and provide two drinks at a time! It is equipped with a built-in burr grinder. 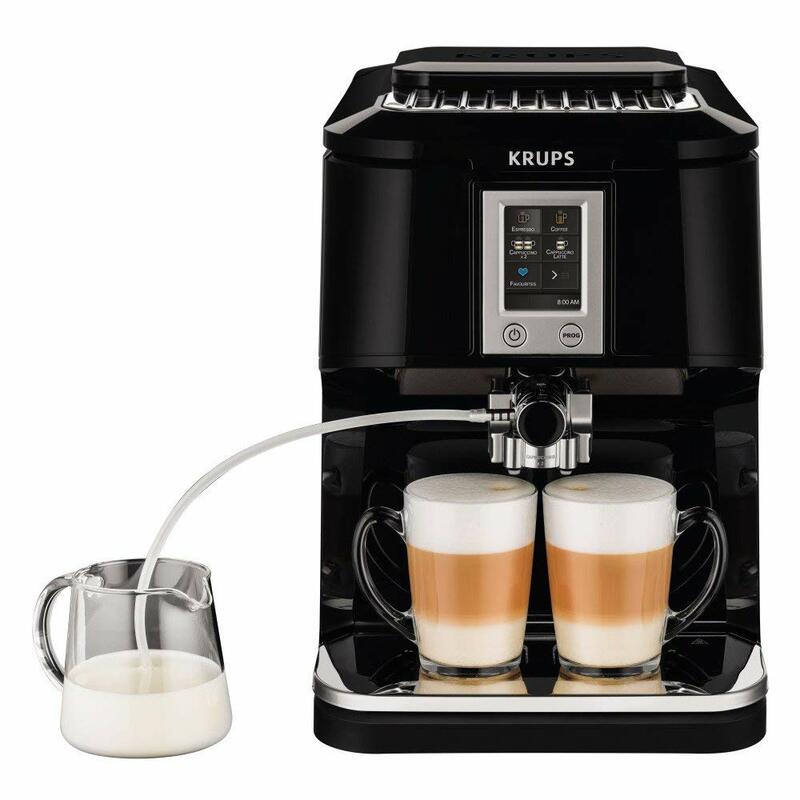 This Krups fully automatic coffee machine makes it easy to brew a wide variety of gourmet beverages, including ristretto, espresso, double espresso, doppio, coffee, double coffee, americano, cappuccino, double cappuccino, latte, double latte, milk foam, and hot water at the touch of a button. Simply place fresh beans in the bean container on top, then select the desired drink from the large menu on the intuitive color touch-screen display. The espresso machine makes automatic adjustments to ensure perfect results every time. Adjust the coffee strength and size manually for customized results, then save personal preferences in the favorites menu. You can also prepare two cappuccino or lattes simultaneously with the machine’s two-in-one function. The milk attachment will froth milk directly in your milk container then pull a shot of espresso, with milk and coffee coming out of the same spout. Enjoy barista-quality coffee drinks at home with the KRUPS EA8808 two-in-one touch cappuccino machine. Fully automatic one button preparation of espresso, cappuccino, Americano, ristetto, lungo, and other great tasting coffee drinks. To create barista quality creamy cappuccinos and lattes, attach the milk suction pipe to the one touch cappuccino block to enjoy fresh frothed milk in seconds. Tweak coffee strength and size settings manually for your best results, then save your personal preferences in the favorites menu. Easy to use color touch-screen user interface. Prepares 2 delicious drinks at once. Programmable clock with auto start and auto-off. Large 9.5 oz. coffee bean container and 59 oz. water tank. Easy to clean milk frothing attachment. Attractively designed for low maintenance. The EA8808 is a compact machine that occupies a small footprint on your counter, but it has a very big footprint in terms of features and variety of beverages available. The design is attractive and will complement any environment. 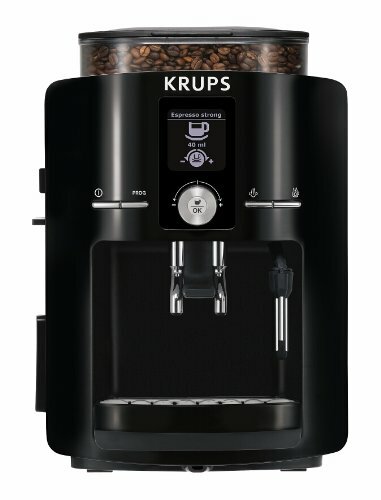 This Krups Two-in-One Touch is designed for easy and automated maintenance. Truly designed for each of use and maintenance, with features like scaling detection and automatic cleaning. Built in burr grinder is very effective at processing whole beans to order, but it can also grind pre-ground coffee. This is a Super Automatic Espresso Machine that makes great beverages and allows for all your little customizations—that slightly limits what you can do manually. 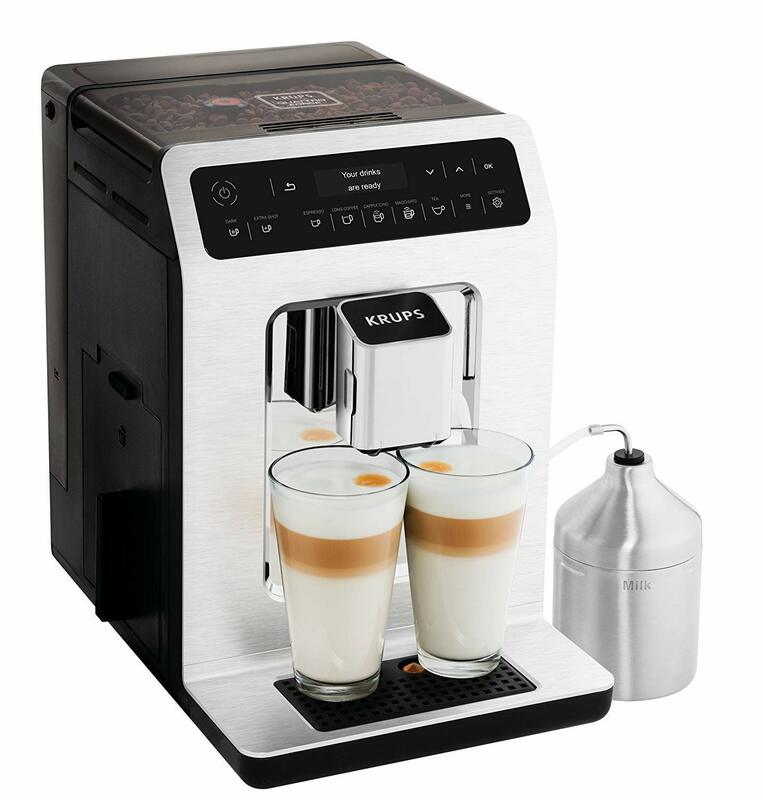 The KRUPS EA8808 two-in-one cappuccino machine is a super automatic espresso machine which produces a wide variety of drinks automatically, while still allowing manual intervention to produce your custom drink. It is well designed both for appearance and for minimizing maintenance. Be aware that it is not as single-cup friendly as a K-Cup machine, but it very convenient for producing a superior, barista-quality beverage. Overall, customers give this machine exceptional ratings for the quality of the coffee drinks produced. It is well worth your consideration. The KRUPS EA89 utilizes what KRUPS calls its “Quattro Force technology” with this well designed super automatic espresso machine to deliver superior performance at every step from bean to cup. 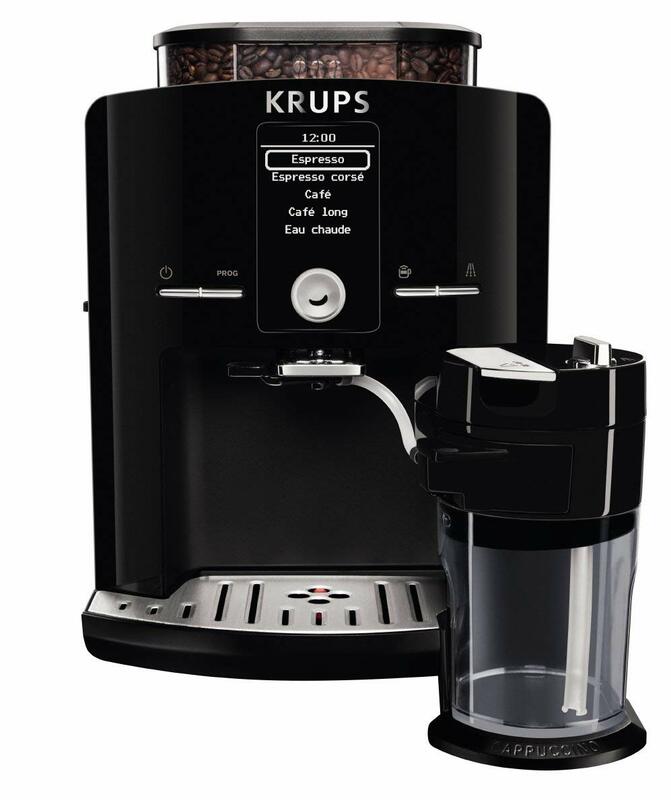 KRUPS optimizes each step, including grinding, tamping, brewing, and cleaning. The KRUPS EA89 has superior design and build quality that accentuates the incredible range of features available in this machine. This machine automatically makes 15 fully customizable beverages. It has push-button access to a wide selection of drinks, including 7 espresso drinks, 5 milk based coffees, and 3 gourmet teas all brewed to perfection. Digital OLED touchscreen allows you to customize each and every drink. At the touch of a button, the KRUPS espresso machine prepares almost any drink including espressos, ristrettos, Americanos, cappuccinos, and lattes to frothy steamed milk or tea. You can prepare one cup at a time or two cups simultaneously to save time. The KRUPS EA89’s user-friendly control panel also allows for customizing the amount, strength, and temperature of each beverage. For example, you can choose “dark” to increase the intensity of the coffee. Similarly, “Extra Shot” will add a shot of espresso to any drink. If you’d prefer a milk based drink, you’ll find options that allow you to do that easily. Some of the drinks you can prepare up include coffee with milk, flat whites, café au lait, steamed milk, and hot milk. If you or your friends would prefer tea, you can also simply prepare hot water with the EA89. The EA89’s design is simple and fits well in almost any kitchen. It has a small footprint. The EA89 is years ahead of its competition in the espresso making department—which is what is most important. With its rich set of features, it is important to look at maintenance. Many machines require users to take them apart and clean each and every individual piece of them manually. However, if it’s that tedious to clean an espresso machine, then maintenance and satisfaction will suffer. Many buyers will look for something simpler. Luckily, the EA89 provides substantial help with maintenance. It features an automated descaling and cleaning program that can run on its own with very little intervention. Talk about saving time and making the most of your espresso machine. Super automatic espresso machine makes drink production simple. This KRUPS espresso maker cleans, rinses and descales itself, so you don’t have clean it like you would a commercial unit. If you’ve been reading the Krups machine reviews online, then you’re probably aware of the fact that Krups is a leading brand when it comes to making high quality espresso machines. One of their most popular models, the EA8442 Falcon has actually gotten tons of positive reviews from thousands of people that have already used it and for good reason: this is an incredible super automatic espresso machine with dozens of innovative features, excellent build quality and great ease of use. In fact, it only takes reading some of its features below to understand how amazing the EA8442 Falcon actually is. Auto off and auto on features. Sixty ounce water tank with integrated handle (removable). Adjustable coffee outlet allows you to use a wide range of mug sizes. Conical burr grinder (metallic) with manual knob allows you to adjust coffee grind size. Touchscreen display (color) allows you to customize your drinks and easy selection. Thremoblock system (compact) with fifteen bar pressure pump. Using the EA8442 is a breeze and in less than 60 seconds it is ready to start brewing your delicious espresso shot. Given the fact that this is a super automatic machine, you don’t need to worry about doing too much work in order to enjoy an espresso. The way it goes is that you choose the types of beans you want to grind, add them into the grinder, add some water and then choose the types of shots (and their size) you want to prepare. By doing so, in less than sixty seconds you’ll be able to have your delicious shot of espresso. The crema is also excellent and is in fact one of the things why so many people love the EA8442 for. Now when it comes to the flavor of the shots the EA8442 can brew, it is both balanced and full. Out of the machine, the espresso’s temperature was about one hundred and fifty degrees F, which seems to be just where most people like it. If you’ve used one such machine in the past, then you’re probably aware of the fact that the EA8442 can also be used as a cappuccino maker. It can actually create a very smooth steamed milk with a lot of cream. However, one exception is the fact that it doesn’t use the standard steam wand, but a tube which can produce a great mix of foamed and steamed milk that averages about one hundred and thirty five degrees with a wide range of milks. There are many preset shots you can choose from, but at the same time you can easily interrupt the flow of coffee to ensure your espresso tastes exactly the way you like it. Better yet, it’s also possible to adjust the strength of your coffee, the temperature of your espresso (3 settings) and the grind of your coffee beans. Even though there are many espresso machines out there that are simple to use, there is none that actually compares to the Krups in this department. Given the fact it’s a super automatic machine, it can clean itself automatically. Also, while some may criticize the milk steaming option, at the end of the day it is very easy to use. As for preparing your espresso shot, the digital panel can make this a very simple process, regardless if this is the first time you’re using an espresso machine or not. The 60 oz water reservoir means that you don’t need to worry about refilling it too often, which is great and saves you quite a bit of time and effort. And don’t even worry about priming the boiler, since the EA8442 is going to do this for you automatically. One thing that you need to bear in mind is that despite the many amazing options this machine has, it cannot take pre-ground coffee and coffee pods. Therefore, you just have to stick to whole coffee beans. Last but not least, it’s very important that you clean your machine properly and this is especially the case when it comes to the steaming tube. Sure, there are a bit more parts you need to clean compared to other machines, yet the entire process is a breeze. All in all, this is a great machine that’s certainly going to become your favorite from the very first espresso shot you’re going to prepare with it. Large 8.8 oz bean hopper and sixty ounce water tank. Makes the best tasting espresso. The EA8442 cannot take pods or ground coffee. The KRUPS EA8298 Espresso Machine is another great fully automatic espresso maker from KRUPS, founded in 1846. Designed and built in KRUPS France, each machine is thoroughly tested to ensure it meets KRUPS high standards for delivering passion, precision, and perfection in every perfectly balanced espresso drinks. 1450 Watt automatic espresso machine with patented Thermoblock system to provide faster preheating. Perfect time and temperature for each cup. The KRUPS EA8298 has a very easy to use interface with an LCD screen and a large knob that performs most important functions. Easy-to-clean milk system with cappuccino cleaning cycle. Metal adjustable burr grinder produces the perfect coffee grind for drinks ranging from espresso to brewed coffee. 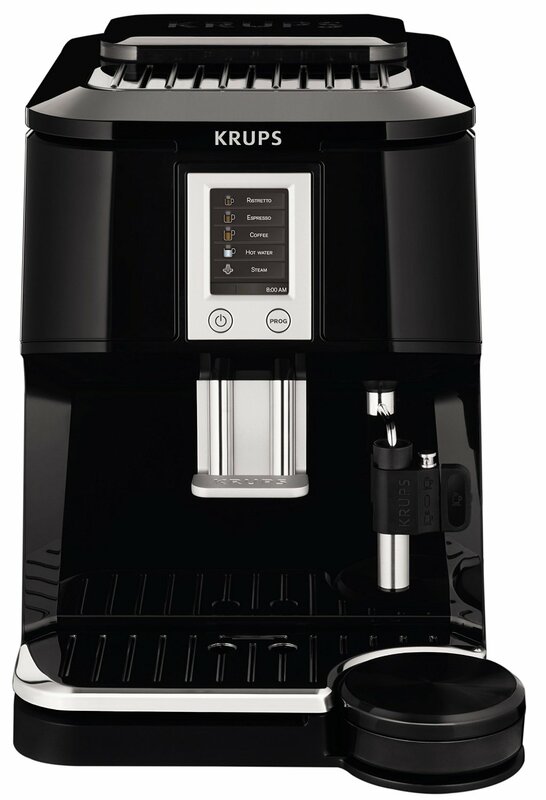 The KRUPS EA8298 will produce a wide variety of great tasting beverages, including creamy cappuccinos, perfectly balanced espressos and perfect coffees at the touch of a button. Add your favorite beans in the clear bean hopper and select your grinding preference. The built-in metal conical burr grinder ensures the perfect grind every time. Enjoy a broach selection of great hot beverages whenever you want thanks to your EA8298 Super Automatic Espresso Machine. The EA8298’s simple design is compact and fits well in almost any kitchen decor. While it is compact, it is a fully functional, fully automatic espresso maker. This KRUPS automatic espresso maker not only makes great espresso—it reduces maintenance with automatic cleaning of subsystems (like the milk system). Built in burr grinder very effectively produces just the right grind for your beverage, and it can also grind pre ground coffee. This KRUPS automatic espresso maker doesn’t have all the bells-and-whistles of a top-end commercial machine or the latest digital interface, but it does what most people want with the push-of-a-button. This is a model being phased out by KRUPS. This might cause it to be available at an attractive price. You might also consider the KRUPS EA89 super automatic espresso and cappuccino machine (View on Amazon) as an alternative. The KRUPS EA8250 Espresso Machine is another fine automatic espresso maker from KRUPS, which has been producing a variety of high quality products since 1846. Designed and built in France, each machine is thoroughly tested to ensure it meets KRUPS high standards for delivering passion, precision, and perfection in perfectly balanced espresso drinks. An LCD screen and ergonomic knob simplify menu navigation and choice of recipe, number of cups, etc. Additional accessories are available to help you enhance your experience: F088 water filter, XS3000 cleaning tablets, F054 descaling powder and XS9000 liquid cleaner for the steaming wand. 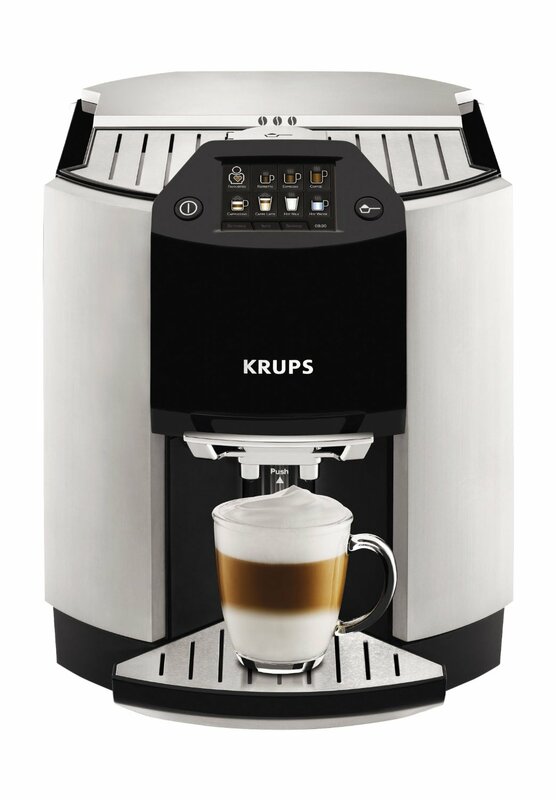 The KRUPS EA8250 will produce a wide variety of great tasting beverages, including creamy cappuccinos, perfectly balanced espressos, rich coffees, flavored teas, and delicious hot chocolate. Enjoy a rich selection of great hot beverages whenever you want thanks to your EA8250 Full Automatic Espresso Machine. The EA8250’s design is simple and fits well in almost any kitchen. It is compact but fully functional. Simple LCD and knob user interface. Krups Barista vs. Falcon: Which is The Best Krups Super Automatic Espresso Machine? So you’re currently pondering on buying a espresso machine for your home and you have no idea if you should get the EA9010 or the EA8442. Well, you’re not the only one, but the truth is that deciding between the two is simple. First of all, the EA9010 comes with a host of features, including automatic steam nozzle cleaning, two step frothing technology, seventeen recipes you can prepare with the touch of a button, a metal conical burr grinder with automating grinding option, digital touchscreen and automatic parameter settings based on the recipe you select. Better yet, it can also prepare white specials and can even brew hot water to prepare tea. On the other hand, the EA8442 is also an impressive machine. It features a compact thermoblock system with fifteen bar pressure pump, a metallic conical burr grinder with manual knob allows you to adjust coffee grind size, but also an exclusive latte tray, adjustable coffee outlet, a large 60 oz water reservoir and auto cappuccino accessory. While both of these machines are great and can make excellent tasting espressos, it all boils down to what you prefer most. If you’re like a machine that comes with lots of features and can prepare many types of coffee drinks, then you should go with the EA9010. On the other hand, if you want a machine that has a large bean hopper and water reservoir, but also allows you to adjust the strength of your coffee and comes with three settings for adjusting the temperature of your espresso and is also cheaper, then the EA8442 is an excellent choice!